Jesús is a vibrant village near Talamanca, a favourite with the locals with a great choice of restaurants and bars. 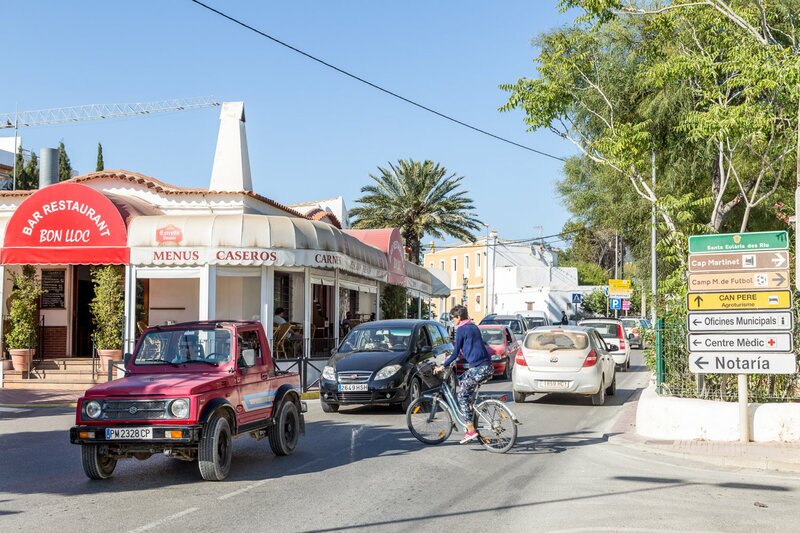 Jesús is located in the suburbs of Ibiza Town, a mere 5 minutes away from the mighty Pacha, and you may be surprised to hear that it has some fab qualities that will make you want to hang out there. We have put together a few highlights of this vibrant village, but if you wander down the main street yourself, you'll see that there are many delightful cafes, shops and bars which create a buzzing atmosphere and a welcoming hub. An Ibiza institution and certainly one of the oldest restaurants on the island, Bon Lloc sits proudly on the main junction of Jesús opposite the church. With a comfortable wrap-around terrace, and a relaxed and informal feel, this infamous eatery is a place where locals flock all year round. The food is unpretentious and very Spanish indeed - tasty plates of tapas to nibble on whilst enjoying an ice cold beer or two, as well as freshly prepared main courses with fish, seafood and meat. A refreshing change from the glitz and the glamour of some of Ibiza's more expensive dining experiences. During the summer, clubbers returning to the north of the island congregate here for the simple breakfasts before calling it a night. Insider info - Bon Lloc are well-known island wide for their spit roasted chicken. Lip-smackingly tasty and ridiculously good value for money, use your fingers and expect to get messy! Within 5 minutes of Jesús, lies a beautiful, secluded beach, S'Estanyol. A narrow arc of a cove with shady pine trees and crystal clear water. By being off the tourist trail, this beach never feels overcrowded, even at the height of the summer season. With a wooden walkway that takes you right into the sea, surrounded by rocky outcrops, this hidden gem is well worth a visit and you will immediately realise you've struck Ibiza gold. On the 8th of September, the church in Jesús holds the annual Patron Saint of Jesús Fiesta. The beautiful Church of Nostra Mare De Jesús comes alive with a full day of festivities starting with mass, and following with a parade with cornets and drums in the church square, offerings of fruits to the Virgin of Jesús, live music and a street party. This special day is steeped in tradition and also gives you the chance to see the famous altarpiece which has 25 painted panels that date back to the 1500s. Insider info - The firework display in the evening is pretty impressive and can be seen for miles around. All day family fun in this stunning little village - find more info in our events calendar. The local butchers is definitely worth a mention. Having been servicing the meaty needs of Jesús for over 50 years, these fellas know their sausages. Serving as a delicatessen also, the cuts of meat are the finest around and the butchers are trained to the highest standard. Insider info - There is no other place to go for your fleshy grub should you be hosting a BBQ, cooking Sunday dinner or just after some lovely jamón (ham) to take as a picnic to the beach. Their organic eggs, foie and champagne selections are so good too, that it is the go to spot for celebrity chefs, hoteliers and your average kitchen connoisseur alike. So hopefully, there are a few reasons here to spur you out of town and into the villages. The cute architecture and the strong sense of community make Jesús a firm local favourite.